Havana is the capital of Cuba and is known for its colourful classic cars, history and interesting architecture. Havana’s peak tourist season is from December to March. The dry season is from November to April and the wet season is from May to October. I visited at the end of August/early September. The advantage of visiting at this time is that there are not as many tourists. The disadvantage is that the weather is very humid. Also, hurricane season is from mid-August to early October. A few days after I left Cuba, Hurricane Irma hit. If you have limited vacation time, avoid planning your trip during hurricane season. If you are arriving from the US, your flight will land at Terminal 2 of José Martí International Airport. If you are arriving from other countries, it will most likely land at Terminal 3, the largest and newest terminal. My flight from Canada arrived at Terminal 3 at almost midnight. The whole process of going through immigration and collecting luggage was quick, perhaps because of the time of day I had arrived. When you exit the baggage area and step into the arrivals hall you will see many people standing around offering taxi services. Go outside and turn right and you will see the currency exchange windows. After you get your money, you can take a taxi to your destination. It should cost between 25-30 CUCs. In Cuba, people always agree on a price before getting into a taxi. I have read that luggage usually takes a long time to come out in Terminal 2 and lineups at the currency exchange are long. The trade of Cuban currency is forbidden outside Cuba, so you can’t prepare your money before you arrive. There are two currencies: the CUC (which tourists are supposed to use) and the CUP (which locals are supposed to use). Since there is a 10% charge for exchanging USD, you should bring Canadian dollars, British pounds or Euros. Australian dollars are not accepted in Cuba. US-issued credit and debit cards (including Mastercard) won’t work in Cuba because of the embargo, so bring plenty of cash (not USD). You can exchange money at the airport or at banks or CADECAs (currency exchange booths) in Havana. Sometimes they ask to see your passport, so bring it just in case. If you have a non-American debit card, you can use the ATMs in town, but you shouldn’t rely on going to an ATM as I have read that they are scarce and often broken. I was lucky to find a working ATM near my AirBnb in Vedado where I could withdraw some money. The Triposo Cuba app has a handy map of ATMs. There are two main types of accommodation in Havana (and the rest of Cuba): casa particulares and hotels. Casa particulares are rooms or apartments rented out by locals. You can usually buy a home-cooked breakfast or even dinner from your host at a cheap price. You can book them by browsing casa particular listings and emailing the host. Many casa particulares are listed on AirBnB, so if you already have an account booking through AirBnB may be more convenient for you! I stayed at an AirBnB in Vedado district in a room with a private bathroom. The view from the dining area was amazing and the hosts were very welcoming. Click here to view the AirBnB listing. If you want a more authentic Cuban experience where you can stay with locals you should definitely stay in a casa! Morning view from my casa particular. Sunset view from my casa particular. Another famous hotel is the Hotel Nacional, located in Vedado next to the Malecon. In its glory days in the 1940s and 50s, it was considered a glamorous destination and was visited by celebrities like Frank Sinatra and Marlon Brando. Even if you are not staying there, you can still visit the hotel’s gardens and enjoy the view of the Malecon. There is also a small museum where you can visit the tunnels dug during the Cuban Missile Crisis. In order to use wifi in Cuba, you will need to buy a wifi card. There are one hour cards and five hour cards. You don’t have to use all the minutes at once. You can use them over several days. Wifi cards can be purchased at ETECSA stands or from locals in parks. If you’re staying in a casa particular, it probably won’t have a wifi connection, but most hotels do. You will still need to buy a card. Check out this in-depth guide to using wifi in Cuba. There are several kinds of taxis in Havana: bicycle taxis, coco taxis, government-run taxis and taxi collectivos. Coco taxis look very cute: round and yellow. Government taxis are yellow and modern. Collectivo taxis are colourful vintage cars. I took a collectivo taxi from La Guarida to Vedado for 7 CUC. The driver originally asked for 10 CUC, but I managed to haggle the price down before getting into the car. If you look like a tourist, drivers will often try to ask you for 10 CUC to go to most places. You can get around pretty easily in Havana by foot. I walked to and from Old Havana to Vedado several times. It took about 40 minutes. A convenient way to see Havana is to take the hop-on-hop-off bus. There are 2 routes. T1 goes around the city, departing near Hotel El Colina and Hotel Havana Libre. T3 departs from Parque Central and goes to the beaches to the east of Havana. This is a must-do activity while in Havana! The best way to see Havana is from the comfort and glamour of a vintage car! I paid 35CUC (not including the tip) for an hour ride around Havana. In Old Havana near the hotel district, there are many drivers waiting with vintage cars. The ride lasted about an hour and the driver stopped at John Lennon Park and Plaza de la Revolution. After the ride, the driver will usually drop you off where he picked you up, but you can also request to be dropped off at another location. I chose to be dropped off at La Coppelia ice cream parlour. If you’re staying in Vedado and walking to Old Havana, you will probably end up walking through Centro Habana on your way to Old Havana (unless you walk along the Malecon). Centro Habana might surprise you as there are huge piles of trash, people dumping buckets of mystery liquid out of windows, and crumbling buildings. If you have never walked through a poor neighbourhood before you will probably be shocked. But this is the reality of daily life for many Cubans. However, although it may appear rough around the edges, Centro Habana is not dangerous and I think it is important to walk through it at least once so that you are aware of how tough life is for many locals. John Lennon Park is in the Vedado district. It is famous for the statue of John Lennon sitting on a bench. Every day, many tourists come to pose for photos sitting next to the statue. This giant square was where Fidel Castro gave speeches to the Cuban people. 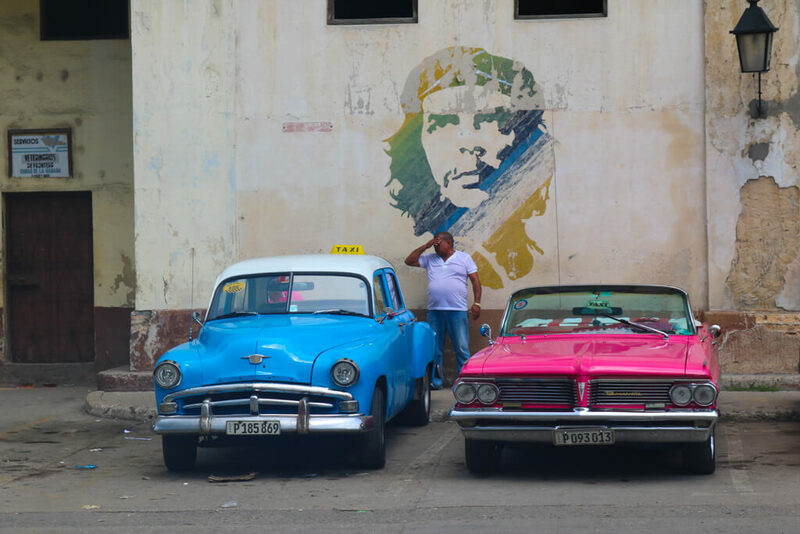 The murals of Che Guevara and Camilo Cienfuegos are must-sees. Across the road from the murals in Revolution Plaza is the Jose Marti Memorial, which is also Havana’s tallest structure. For 2CUC you can take the elevator up to the top of the tower for an excellent panoramic view of the city. Morro Castle is a 17th century fortress that guards the entrance to Havana Bay. Visitors can check out the moat and lighthouse and admire the views of the Bay. At night, cannons are fired as a tradition. You can sit on the walls of the Malecon and watch. Across from Morro Castle is La Cabana fortress. You can visit a small museum here. On your first day in Havana, I recommend visiting the Museum of the Revolution to learn about Cuba’s history from a Cuban perspective. You will learn a lot about Che Guevara, Fidel Castro and Camilo Cienfuegos. Outside the museum you can see tanks and planes. Besides the Revolution Museum, you might be interested in visiting the National Museum of Fine Arts of Havana or the Napoleon Museum, which houses the largest collection of Napoleon artifacts outside of France. Old Havana is a wonderful place to wander around. Here you can visit the three main squares: Plaza Vieja, Plaza de Armas, Plaza de la Catedral. Before the Cuban Revolution of 1959, the Cuban Congress was located here. Today the Capitol houses the Cuban Academy of Sciences. Callejon de Hamel is a street in Havana that features Afro-Cuban art. However, I found it very crowded and touristy. I wish I had gone to Fusterlandia instead. Filled with interesting murals based on Gaudi’s style, it is outside the city and less crowded. Hemingway wrote in the Hotel Ambos Mundos, and you can pay 5 CUC to visit his room, which is now a museum. The Malécon is a 7km long road that stretches along a seawall. It is a popular place for locals hang out in the evenings, playing music, fishing, and even going on dates. On one side of the road you can admire interesting buildings as you stroll, and on the other, you can watch the waves crashing against the seawall. El Floridita is a bar famous for its daiquiris. It was a favourite hangout of Ernest Hemingway and now it is a popular tourist attraction. I went inside briefly to have a look but it was so crowded that I immediately left. If you want to go you should arrive when they open or visit later in the evening to avoid the crowds. Known for its cozy, romantic atmosphere and beautiful view of Centro Habana, La Guarida is Havana’s most famous paladar. Although it is pricey (expect to spend around $100 for 2 people), the food and service are excellent. If you don’t want to eat in the restaurant, you can visit the bar instead. It also has great views. Since La Guarida is so popular, you should make a reservation if you want to have dinner there. I made mine more than a week in advance during low season and the original time I requested had already been booked, so make your reservation well in advance. You can submit your request on the website. I submitted mine at night and the next afternoon received a confirmation email. However, the email said that I would have to call the restaurant 24 hours before my reservation or it would be cancelled. So I asked my casa host to call for me. She tried many times but no one ever picked up the phone. So the morning of my reservation I went to La Guarida in person to ask about it. The lady at the entrance confirmed my reservation for me. The food is tasty but on the pricier side for food in Havana. Expect to pay around 100 CUC for a meal for two people. A cheaper option would be just going to La Guarida’s bar (located upstairs from the restaurant) and ordering drinks. The view up there is great and you don’t need to make a reservation. Nazrovdie is an interesting Soviet style restaurant right by the Malecon. Outside you will find an employee dressed in a traditional Soviet navy uniform advertising the restaurant. There is an indoor seating area as well as a balcony where you can enjoy the sea view. There are many Soviet hats which you can try on. I tried the Voyage Through the USSR food sampler, which was delicious. I first heard about this restaurant on Luda’s blog. Read it for an in-depth review of Nazrovdie! Habana 61 is a modern restaurant in Old Havana. I went during low season and just walked in, but during high season you should make a reservation. I had ropa vieja, a traditional Cuban dish made of shredded beef and vegetables. Ropa vieja literally means old clothes, but the dish was delicious! El Dandy is small, cozy restaurant near Plaza Vieja. I just had a limonada here, but I saw a group order a platter of tacos and they looked absolutely delicious! The prices are on the cheaper side. La Coppelia is a huge ice cream parlour that was featured in the film Fresa y chocolate. You can see long lineups where locals often wait more than an hour for a seat and ice cream. Note that these lineups are for paying for ice cream in CUPs. There is much smaller dining area meant for tourists, where you can pay in CUC. If you have CUP and want a cheaper, more authentic experience you can line up with the locals. The ice cream menu changes every day, and I think the CUP area has more flavours. I tried strawberry, coconut and mango pineapple ice cream. They were all delicious! It’s hard to describe but the ice cream at La Coppelia had a special taste that I have never encountered before! Get to the airport at least three hours before your flight, especially if you leaving from Terminal 2, where I’ve heard lineups are extremely long. I arrived at the airport around 4:45 am for my 7:45 am flight. At that time, no check-in counters were open for Air Canada yet so people just sat around and waited. After about 20 minutes, one check-in counter opened and passengers started lining up. I was near the front of the line. As the attendant checked my passport and put the luggage tag on my suitcase, she kept pausing to greet her coworkers (who had just arrived) by kissing them on the cheeks. This made the process very slow. All the while, a long line of passengers was waiting behind us. Fortunately, a couple more check-in counters opened up so the line started to move. Since I didn’t use wifi at all during my trip to Cuba, I hadn’t checked in online as I usually do, and therefore had forgotten to pay the baggage fee Air Canada charges before going to the airport. Luckily I was able to pay it with a credit card as I didn’t have enough cash left. However, the transaction took forever to go through, while the ticket attendant talked to her coworker and said something about the embargo. That was a nervewracking experience so don’t be like me! Remember to bring enough cash to pay the luggage fee in case the machine doesn’t work! Or try to pay it online before going to the airport! I remember someone once said Havana is like an exotic car museum and I would love to take taxis if this is what they look like ! I had no idea that Cuban currency is illegal to trade outside and hence can be bought only in the country, thanks for that tip. The pool at Kempinski hotel looks just like the kind of place I’d like to chill! Oh my, these pink vintage cars drive me crazy :DDD. And I love this view from the pool.. A dream during sunset! Kempinski hotel, I take notes! The cars are what I want to see..I am so dying to go there!! Your pictures are wonderful, and these are great tips..I hope I make it there someday!